Space Station and Dragon: Astrophoto by Bill Longo. A Dragon chases down a huge denizen of space. Click to embiggen. I post a lot of images taken with some pretty nice astronomical gear, from “amateur” telescopes up to multibillion dollar space observatories. But it doesn’t always take a lot of fancy equipment to get great shots. Sometimes it just takes a camera, a tripod, and a little foreknowledge. Armed with just this, astronomer Bill Longo took the image above from his observatory outside Toronto. It’s a stack of eight 30-second exposures for a total of four minutes using a Canon T3 camera and a 6.5mm lens. It shows the night sky facing west, with the bright winter stars of Auriga and Gemini setting, with the amazingly bright planet Jupiter punctuating the twins’ belly. And that bright streak seemingly bisecting Jupiter? 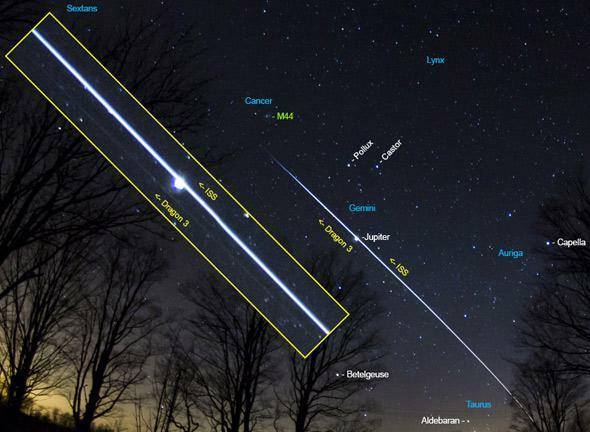 Why, that’s just the International Space Station moving across the sky, its 100-meter length reflecting sunlight down to Earth. Imagine! 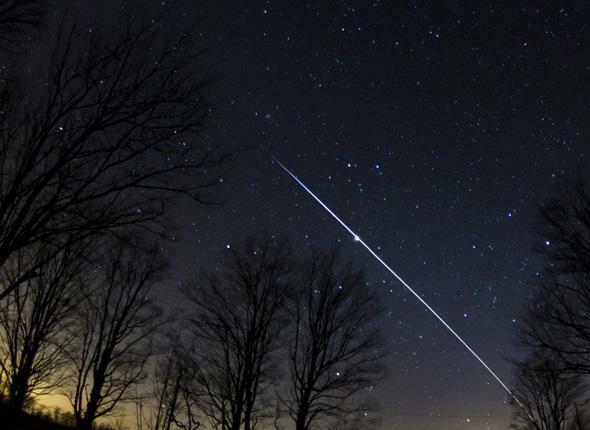 Six astronauts from around the world are in that bright streak, and were about to grapple an American spacecraft using a robotic arm built in Canada, so they could bring aboard a new round of scientific experiments, food, and supplies for their stay on board a working space station that’s been in orbit around our fair world for more than 5600 days. And it’s bright enough to not only be seen from the ground, but easily seen, and photographed with equipment you can pick up at a local store. You can keep your flying cars and hoverboards. We live in the future, now, and all you have to do to prove it is go outside look up. Tip o’ the lens cap to Bill Longo for sending me his photo.